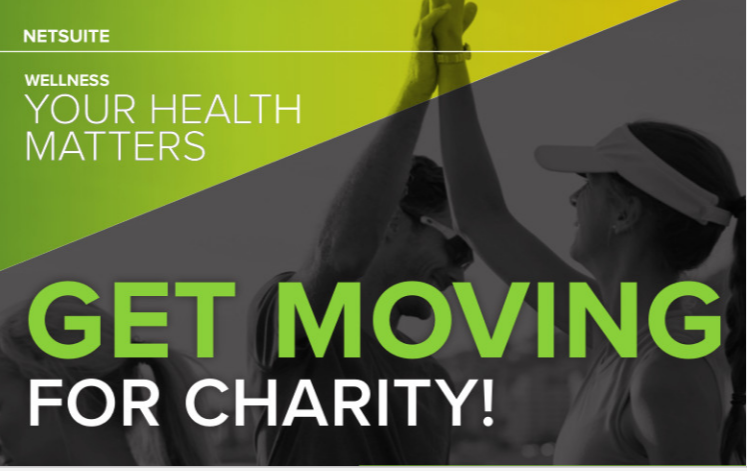 Close to 1,000 NetSuite employees recently participated in “Get Moving for Charity”, a charity wellness competition that encouraged employees to walk and run on behalf of one of four charities. Over two weeks, employees logged 37,855 miles on behalf of the following incredible organizations: Gawad Kalinga, Stop Hunger Now, Girls on the Run, and Guide Dogs for the Blind. Just think about that! In 2 weeks, employees walked nearly DOUBLE the circumference of the earth (24,901 Miles) or, as the crow flies, walked from San Mateo to Brno to Manila and back to San Mateo TWICE! Incredible! And while it was a close race, the team competing for Guide Dogs for the Blind was the winner, with employees walking an average of 56.5 miles and winning the organization $10,000. 2nd place: Girls on the Run with 51.5 average miles/82.9, winning a $5,000 USD donation. Stop Hunger Now with 48.1 average miles/77.4 kilometers and Gawad Kalinga with 43.8 average miles/70.5 kilometers. Each team has won $2,500 USD for their charities. The competition was part of NetSuite.org, the corporate citizenship arm of NetSuite, which mobilizes the company’s corporate resources for social impact through software donations and volunteer programs.